Benefit from Unisyn’s first opinion service! 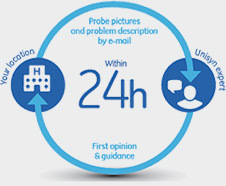 Ask Unisyn experts for their first opinion when your probe develops a fault. No matter the model, no matter the brand. Submit your Check Your Probe request in a few minutes only! Simply fill out the form available on the bottom of this page. Listen to Christian Rompf, managing Unisyn’s European repair center, and discover our technical know-how. Submit your Check Your Probe request in a few minutes only! Simply fill out the form available on the right of this page. repair center, and discover our technical know-how.